It’s a frequent cry from new puppy-owners. You bring home your cuddly fluffpup - you are overflowing with parental emotions for this little scrap and determined to do the best for her. Trouble is, that cuddly fluffpup turns into a screeching monster as soon as you put your head on your pillow. So you go down to see what’s wrong - is she hungry? is she cold? does she need a wee? By the time you’ve exhausted all these possibilities, both you and your puppy are well and truly awake. The puppy is now refreshed and ready to start the day. But it’s half past midnight and you have to be at work tomorrow morning! This seems to be the stage when one of the pup’s new owners fetches the duvet downstairs and tries to sleep on the sofa. In no time it’s 4 a.m., the puppy is refreshed and you are not. DOWNLOAD your guide here to getting a good night’s sleep with your new puppy! As you stagger into work on the fourth or fifth day you realise that This Is Not Working! That’s when I get a phone call. The caller is usually desperate: sleep-deprived, anxious, guilty, worried, their work is being affected, they see no light at the end of this tunnel. Some people actually return the puppy to the breeder at this stage: really! I often find they have a crate for their dog, but haven’t used it, or they’ve tried using it but won’t shut the door, or it’s in the wrong part of the house. They may think it’s cruel to confine the puppy to a crate - but I can assure you that the breeder confined the puppies (3? 6? 10 of them?) at night! Most people are comfortable putting their baby in a cot - for their own peace of mind as well as the babe’s safety. What’s the difference? The next thing I learn is, “I don’t want the dog in the bedroom”. As they are usually at the stage where they are actually paying me to give them a night’s sleep, this is particularly shortsighted. Your puppy is used to snuggling up with those 3, 6, or 10 warm, furry, littermates - suddenly being alone is a loss and causes fear. My own puppies sleep through the night from the day they arrive. They quickly get into a pattern and will be clean and dry by night from anything between 7 and 9 weeks. Get started with this Puppy Training Mini-Course with video lessons for speedy learning! It doesn’t need to be the size of a ballroom - only big enough for the puppy to get up, turn around, and lie down again. It’s a bed, not a playroom. If you’ve bought a large one because your pup is a large breed but is currently still tiny, you can either buy a crate divider - or simply fill the extra space with cardboard boxes to make a smaller sleeping area. No problem if he chews the boxes. A well-reared puppy will not normally soil his sleeping area (unless very distressed) so this helps with your housetraining program. If you have a whippet, earthdog or other tunnelling breed, provide masses of blankets your pup can burrow into like a hamster, rather than a flat single piece of bedding which will better suit a hot dog like a border collie or a golden retriever. Shut the crate for every nap, every sleep, every meal. Never open the crate door if your dog is hollering, “I’m going to get my lawyer if you don’t let me out of here!” Only calm and silence will get that door opened. (Genuine distress is something else, and needs attention - you should be able to distinguish between annoyance and distress with ease.) Darken the room and/or partially cover the crate - this makes it a cosy den. For naps, leave the room and shut the door. Your puppy will hear you breathing and moving, sighing and snoozing. If she wakes up anxious, you can just reach a hand out to touch her through the bars so she is reassured she’s not alone. You’ll hear if she’s genuinely agitated and needs a wee. If you don’t want your dog to sleep in your bedroom, you can move her out again once a pattern is established and she feels confident in her new home and routine. The crate is a quiet area for s-l-e-e-p-i-n-g. And chewing chew toys, and eating meals. It’s not a chatty place. Imagine the crate is soundproof - both ways! You have now taught your dog to relax and settle anywhere she finds her crate. This is invaluable training for the rest of your lives together! No separation anxiety, no pacing and worrying when you holiday in a new place, no danger of damaging the carpets or cables when visiting friends. When your dog goes into her crate, she lies down and sleeps! Let me know in the comments below how you’re getting on! And for more force-free solutions to everyday puppy problems, get your free e-course here. If you want a step-by-step guide to everything about your new puppy, get New Puppy! Dog series. 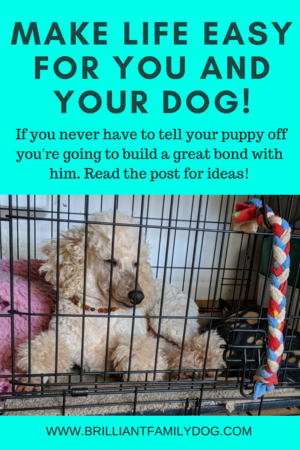 Once your puppy is about 9 weeks old and has settled in with you, you can start working through the Brilliant Family Dog series of how-to e-books. Everything is broken down for you into little steps - and what’s more, the first book in the series is free! Go get it now. And here's your free guide to getting a full night's sleep with your new puppy, from the first night!